Tips on preparing for and taking the ASE test. The T2 ASE Test Task List, which lists the knowledge that a technician must have to pass the T2 ASE test. Extensive Diesel Engine Mechanical, Lubrication, Cooling, Air Induction, Fuel, Exhaust, Starting System and Engine Brake diagnostic information, including symptom descriptions and their causes, as well as complete engine testing procedures, with the interpretation of test results. Extensive Diesel Engine Mechanical, Lubrication, Cooling, Air Induction, Fuel, Exhaust, Starting System and Engine Brake repair information, including detailed disassembly, cleaning, inspection, repair, adjustment and assembly procedures. A Practice Test, with all questions written in the ASE style. The answers to the Practice Test questions contain thorough explanations for each answer. A comprehensive Glossary, including all diesel engine-related terms used in the Study Guide. 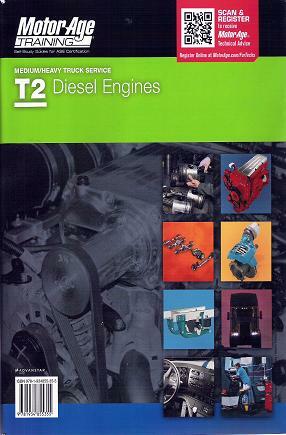 In addition to the easy-to-read text, the Motor Age T2 Medium/Heavy Truck Diesel Engines Self-Study Guide contains dozens of useful illustrations, and like all Motor Age Self-Study Guides, it is spiral bound, which allows the pages to lie flat for ease of use. You’ll also find the Motor Age T2 Medium/Heavy Truck Diesel Engines Self-Study Guide to be a handy reference manual that you can use on the job after you’ve taken the ASE test.